WEDNESDAY, Dec. 28, 2016 (HealthDay News) -- Diabetes leads a list of just 20 diseases and conditions that account for more than half of all spending on health care in the United States, according to a new comprehensive financial analysis. U.S. spending on diabetes diagnosis and treatment totaled $101 billion in 2013, and has grown 36 times faster than spending on heart disease, the country's No. 1 cause of death, researchers reported. "After adjusting for inflation, we see that every year the U.S. is spending 6 percent more than we spent the year before on diabetes," said lead researcher Joseph Dieleman, assistant professor at the University of Washington Institute for Health Metrics and Evaluation. "That's really a remarkable growth rate, notably faster than the economy is growing or health care spending as a whole," he said. The annual rate of growth in health care spending between 1996 and 2013 has been 3.5 percent on average, Dieleman noted. "Spending on diabetes grew twice as fast as all conditions combined" during that 18-year period, he said. The study findings were published in the Dec. 27 issue of the Journal of the American Medical Association. Americans spent $2.1 trillion in 2013 on diagnosis and treatment of health problems, which amounts to more than 17 percent of the total U.S. economy, the researchers concluded from their analysis of federal data. "That is a staggering, almost unimaginable amount," Dr. Ezekiel Emanuel wrote in an editorial accompanying the new study. Emanuel is chair of medical ethics and health policy at the University of Pennsylvania. "Indeed, this level of spending makes the U.S. health care system the fifth largest economy in the world, behind only the U.S., Chinese, Japanese and German national economies," Emanuel pointed out. Dieleman and his colleagues broke down the $2.1 trillion spent in 2013 across 155 different health conditions, to see which diseases were drawing in the most dollars. Ischemic heart disease -- $88.1 billion. Low back and neck pain -- $87.6 billion. High blood pressure -- $83.9 billion. Injuries from falls -- $76.3 billion. Dental care -- $66.4 billion. Vision and hearing problems -- $59 billion. Skin-related problems -- $55.7 billion. Pregnancy and postpartum care -- $55.6 billion. "There are things on that list that, when we think of health care, they're not necessarily the things the average American would think of," Dieleman said. 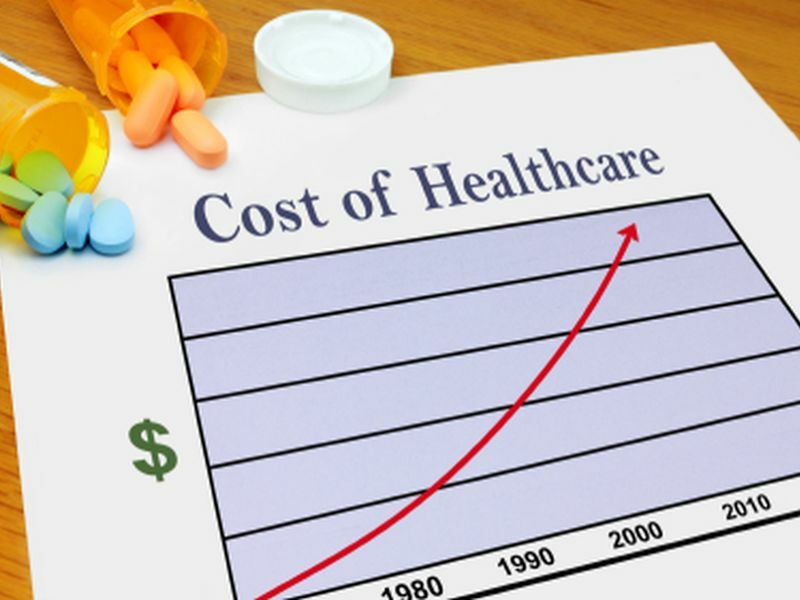 The first five conditions alone comprised 18 percent of all personal health care spending and totaled $437 billion in 2013, the researchers noted. Cancer did not make the list because the researchers split the category into all different types of cancers, such as breast cancer and colon cancer, Dieleman said. All combined, cancer care cost about $115 billion, the study found. However, Dieleman added that this study only looked at total dollars spent on health care, and not whether the dollars were spent wisely. A follow-up report coming out in a few months will connect the money to risk factors that cause illness. "I think of this study as providing a landscape," he said. "It tells you where to start digging deeper. For example, it tells you we're spending notably more on diabetes, and now we can think about why that is." Of the money spent on diabetes care in 2013, more than 57 percent went to medications and 23.5 percent went to outpatient care, the study authors reported. "We know in diabetes most of the growth was in pharmaceuticals," Dieleman said. But that doesn't necessarily mean money for medications is ill-spent, he added. "I think people are quick to point at pharma, but if medications are preventing trips to the clinic, that's not necessarily a bad thing," Dieleman said. "Spending on treatment of high cholesterol is almost exclusively pharma, and that's probably a good thing." On the other hand, billions are being spent on low back and neck pain, and 70 percent of that spending is for working-age people younger than 65, Dieleman said. "When I talk with medical doctors about this, there's some cynicism about the effectiveness of the spending on low back and neck pain," he said. "Low back and neck pain is certainly one of those places where we're spending a lot, and it encourages us to look closer and evaluate what we are getting out of that spending." Emanuel agreed in his editorial. "Rates of pain-associated health problems are actually increasing, rather than decreasing, and few people would rate the U.S. performance on these conditions as exemplary," he wrote. "Patients who want pain relief often undergo surgery, even when rest, physical therapy and nonsurgical interventions would be equally effective," Emanuel said.